I understand that there is a bug in the v1.25 Insydeh20 BIOS which effects serveral laptop models including the Aspire F5-571 which stops the installation of Linux distributions. There are older versions of the BIOS available for other models (E5-573G) which rectify the problem, but none available for the F5-571. My question is: Would the bios software for the E5-573G the same as the BIOS for the F5-571. or referal to a linux distro that would be supported? it works bios are all the same! I have also found the same issue, but I am not brave enough to make the same move as davidbepo did. Anyone knows how long does it take for Acer to solve this kind of issue? Do they react quickly? Otherwise, I may return the laptop. Someone has tested to change the Bios?. Greetings and i'm sorry for my english. Finally after about a week waiting for an Acer SAT response without luck (very poor technical service), i've decided to test to downgrade the bios using the above link. After the first run i've seen that the BIOS model is the same then I've edited the file and i've run the update. Now i've writting from the computer so it still alive and i've booted a live version of Ubuntu 14.04.03LTS without problem, so the problem is the latest version of the bios. Tomorrow i will backup the whole drive using Clonezilla and i'll try to install Ubuntu. I'll report if i make the wifi works on ubuntu because maybe it only need to install the Atheros proprietary drivers. I'm sorry for no post any screenshot, but just run the updater and the computer restarts to program the bios. - You've to downgrade the bios using the above link. Don't care if the laptop model is different. - Change the touchpad mode to basic on BIOS. - Install your prefered Linux version and enjoy. With that steps finally the Clonezilla has booted and i've done a full hard drive backup without problems and i've installed the Ubuntu 14.04.3 version. Just reboot and you will get the wifi working. Maybe it will work with other linux versions too because we are compiling the source. The only problem (at least on Ubuntu) is that reboot did not work, you have to shutdown the computer and then power on again. EDIT: I've reinstalled Ubuntu again to test the exact above steps and now reboot is working fine too. I got no help from Acer support who said it was a hardware fault and that I should send in the machine for repair! Thanks to Danixu86's post I plucked up the courage and followed the instructions to downgrade the BIOS. It was simple and worked beautifully so I could boot with a live DVD. I hope others will be able to be reassured by this. I had a few problems, such as the wired connection wouldn't work, which a reboot of the router sorted out. I followed How to dual-boot Linux Mint 17.2, Windows 10, Windows 8.1 on a PC with UEFI firmware to dual boot which worked fine. But the computer would only boot into Windows. F12 brought up a Linux option, but in subsequent boots that option vanished and no sign of grub. I am typing this in a full install of Linux Mint 17.2 with Cinnamon. so that subsequent make and make install failed. Any suggestions? 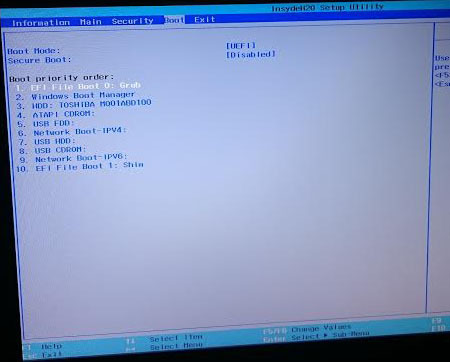 About first problem, i had the same behaviour but i've changed the order on BIOS and i've set the GRUB on fist place. Maybe you have to add the efi file to trusted boot files on bios too and maybe you have to disable Fast boot on Windows too. It was not neccesary on Ubuntu but maybe on other is it. With the boot problem, I had disabled fast boot and I changed the order in the BIOS but that only applies to the disk drives, not the various OS's in them so it then loads the UEFI configuration which doesn't mention GRUB. Some BIOSes allow you to edit the UEFI boot order but not Acer's. Anyway it's all working well now. Thank you for giving me the nerve to try the BIOS downgrade and then for sorting out the wifi. Have a virtual beer on me! I've changed the boot order on my Acer computer too . Maybe you have to disable secure boot or just add the files to trusted UEFI files. - On Security Tab i've added both linux boot files (grubx64.efi and shimx64.efi) on "Select a UEFI file as trusted for executing" (Maybe with grubx64.efi only will work too). Later i've disabled Secure Boot, but is not neccesary. Ah, I hadn't added the efi files on the Security tab so the boot order only showed the Windows Boot Manager and HDD etc. But that will be useful to know and implement if Windows starts messing things up again. I've edited the other post to add all the new info. Maybe will help other users. That is what is supposed to happen. If you read the instructions at http://community.acer.com/t5/E-and-M-Series/Acer-Aspire-e5-573g-You-can-not-install-any-one-Linux/m-p/386281#M3080 carefully you will see that you have to copy a folder, make a small change to a file and then run an installer to make it work. It works beautifully! now ubuntu is running fine. Good news everyone who don't want to downgrade the BIOS version. The latest version (1.35) seems to fix the problem. I'm writting this message after upgrade to that version and from my Manjaro Linux. Does anybody know is this problem with the Linux exist on Acer Aspire F5-573G-75Q3?